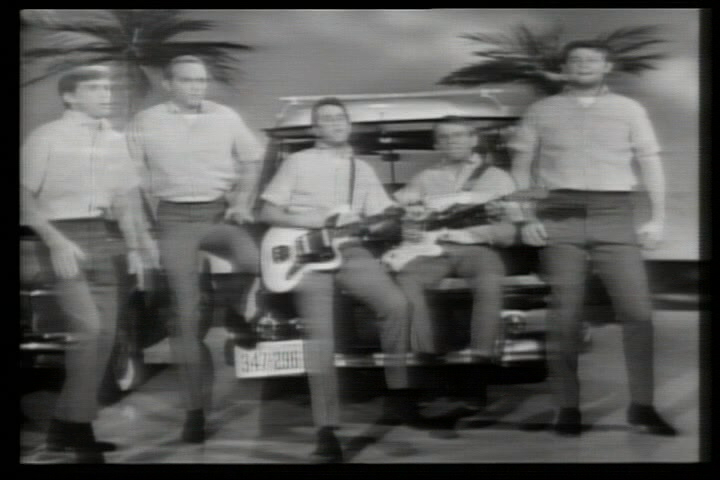 After The Beatles, The Beach Boys were the first band I really loved. I bought records that I couldn’t really play, committed an A&E Biography of Brian Wilson to memory (still looking for a way to put this skill on a resume), and I may have even fashioned some Beach Boys puppets out of popsicle sticks. Okay, so maybe I was a little obsessed–crazy, even (popsicle sticks?! )–but my love for this band, including their introverted, slightly off-center leader, was so indelible that fifteen or so years later I approached Love and Mercy, Bill Pohlad’s biopic about Brian Wilson, with both excitement and trepidation–excitement because I love Brian Wilson and his story, trepidation because there is so much room for error. 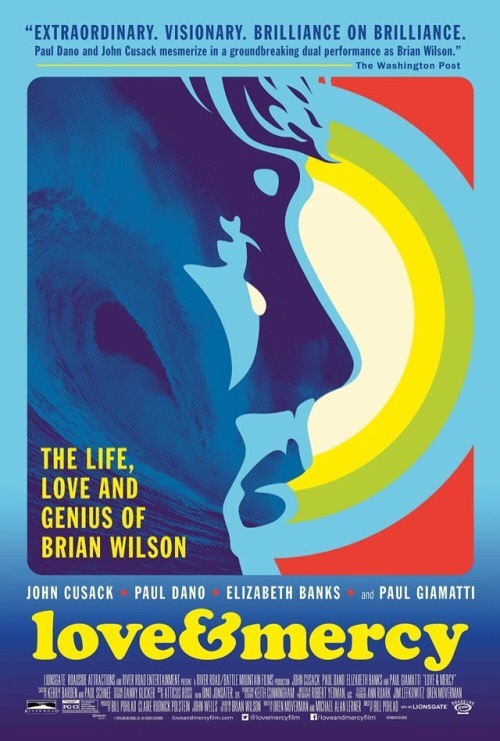 Love and Mercy tells the story of Brian Wilson in two distinct periods of his life. His story is told by two different actors out of necessity. The Brian Wilson of the 1960s was a very different person from the Brian Wilson of the 1980s. It’s that simple. He was different, both physically and mentally. It would be impossible for a single actor to play both roles; it would be asking too much. It’s a miracle that Brian Wilson lived through the experiences. How can you ask one actor to do the same? 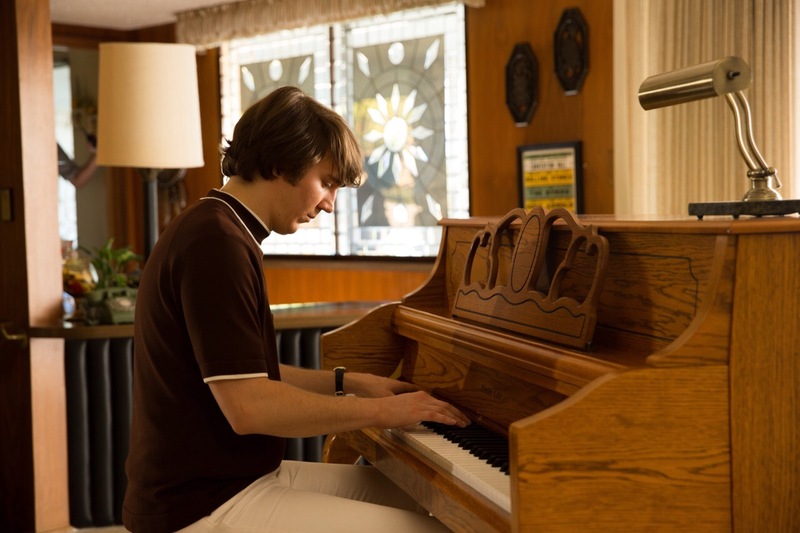 In the first narrative, Paul Dano plays Wilson in his mid-20s at the height of his musical powers creating Pet Sounds, “Good Vibrations,” and the ill-fated Smile album. The seeds of mental illness are evident, however, as Brian begins to suffer notably from auditory hallucinations and paranoia during this period. The later thread shows the progression and effects of this mental illness. In the 1980s, Brian (now portrayed by John Cusack) has become a somnambulant and over-medicated prisoner of his controlling and manipulative doctor, Eugene Landy (played with terrifying ferocity by Paul Giamatti). When he meets his future wife, Melinda (Elizabeth Banks), for the first time, he leaves her a note on the back of her business card: “Scared, Lonely, Frightened.” Each thread is equally compelling, even though I initially doubted that the 1980s story would be able to hold my attention the way the Pet Sounds sessions would. I was also uncertain that John Cusack could convincingly render Wilson. My doubts were ill-placed. I was wrong. I feel like one of those freaks that booed Dylan at the Newport Folk Festival in 1965–and not even one of the freaks booing because the sound quality was poor, but one of those folk purists irate at Dylan for plugging in an electric guitar. Oh my gosh. Don’t be one of those freaks. The quality of Cusack’s performance is not poor; it is subtle and sensitive and maybe different from anything else he’s ever done before–I wouldn’t know, though, because I never made a popsicle puppet out of his head. Brian (John Cusack) and Melinda (Elizabeth Banks) outside the Griffith Observatory. Cusack undoubtedly has the more difficult role for one simple reason: there is virtually no music in the 1980s storyline, and if you want to know Brian Wilson, you have to listen to the music. Cusack instead has to communicate Wilson’s thoughts and feelings through his walk, his mannerisms, nervous ticks, and wooden speech. There is a single scene where Cusack’s Wilson sits at the piano and plays a song for Melinda, and for a brief moment, you catch a glimpse of the creative, trusting, sweet man that Wilson is or was or could be. As impressive as Cusack’s depiction is, Paul Dano is, quite simply, amazing. A·maz·ing. AMAZING! Oh my gosh. I am ready to make a popsicle puppet out of this guy’s head. (I’m kidding. I think.) Dano physically bears a stronger resemblance to Wilson, and he even sings like Wilson in the film–so much so that it is often difficult to discern whether it’s actually Dano or Wilson singing. Music helps Dano’s characterization significantly. When Dano’s Wilson is in the studio, headphones on, singing with his brothers and cousin and bandmates, he just looks so happy and at ease. I felt tears welling up in my eyes because I know that’s who Brian Wilson is. Brian (Paul Dano) plays “God Only Knows” for his cruel and abusive father, who tells him it sounds more like a suicide note than a love song. Dano’s skill is part of what makes the 1960s story so satisfying to watch, but it’s also the recreation of the period. The attention to detail in the film is extraordinary: the filmmakers faithfully replicated Beach Boys concert footage, the studio where Brian created Pet Sounds, and every piece of clothing, right down to Mike Love’s dumb fur hat. There is little humor in the 1980s (mostly it derives from whatever Paul Giamatti is wearing), but the humor is abundant in the 1960s. Remember, Brian Wilson is actually a very funny person. While the rest of the band has been on tour in Japan, Brian has been at home in the studio, working tirelessly on Pet Sounds. When the band returns to the studio to record vocals, Mike Love pats cousin Brian’s belly and tells him he’s put on some weight. “You need to go on a fast with me sometime,” he tells Brian. “I’m eating as fast as I can,” Brian responds. Amen! Humor also comes in the form of Mike Love’s existence. Concerned about the lyrics of “Hang on to Your Ego” (turned into “I Know There’s An Answer” on the released album because Love refused to sing the lyrics of “Ego”), Love whispers to Brian “Is this a druggie song?” The rest of the guys roll their eyes. (I imagine this happened a lot because Mike Love is really embarrassing. It’s kind of a mystery how and why they let him in the band.) Humor comes from one liners from brother Dennis (who looks less like Dennis but acts like Dennis so it’s OK). “Surfers don’t even like our music,” Brian insists in response to Mike Love’s claim that they should keep making music about surfing and cars and girls because that’s what their fans love and understand, not the radically different music and lyrics of Pet Sounds. “They don’t,” shrugs Dennis, with perfect timing. And a lot of humor comes from Brian Wilson’s two dogs, Banana and Louie, who are featured on Pet Sounds. They steal every scene they’re in, including one of my favorites. With Pet Sounds having been completed and received lukewarmly by fans, Brian and the band are moving onto their next project. Brian has an idea for a song about the vibrations dogs pick up from people, but, as always, he’s struggling with lyrics. He calls Mike over to help. Brian sits at his piano, placed in a sandbox in the middle of his living room, and pounds out the rhythm. Mike suggests some lyrics, and they begin to put the two together. Banana barks (and maybe does something else). “Well, piss on you, Banana, I like it!” Mike scolds. To some, the narratives of Love and Mercy may seem disjointed and unrelated. I disagree. Even though Brian Wilson was different in the 1960s than he was in the 1980s, there are striking similarities and parallels. In 1985, Brian Wilson is starving. “I’m hungry, Gene,” Brian tells his doctor. “You’re not hungry! You only think you are! Can’t you tell the difference?” Landy screams in response. Brian is starved of food, his family, his free will, his music, and love. He is the victim of Dr. Landy’s control and cruelty. In the 1960s, Brian Wilson is starving, too, even though he is saturated with food, drink, and drugs. He craves the approval of his brutal father, and he ultimately abandons Smile not just because he is taking way too many drugs (which he is) but because he is starved of the musical support and love of his bandmates. Even though he always brought so much love and happiness to others through his music, Brian Wilson himself was always looking for love. Love and Mercy is a sensitive, factual film. Of course it doesn’t tell you everything about Brian Wilson or The Beach Boys. (To the reviewer complaining that the film doesn’t explain the presence of Tony Asher and Van Dyke Parks: well, piss on you! Read a record label and figure it out for yourself. Actually, it’s pretty clear who Van Dyke Parks is in the film, so I don’t know what your hang up is.) It can’t, and it doesn’t need to. It just needs to offer you a representation of who Brian Wilson was and why he–and his music–matter. It does just that, with the finest acting and the best soundtrack. I can’t wait to see it again. Uh, yeah. Right. Baby needs a step ladder to get up on that car.